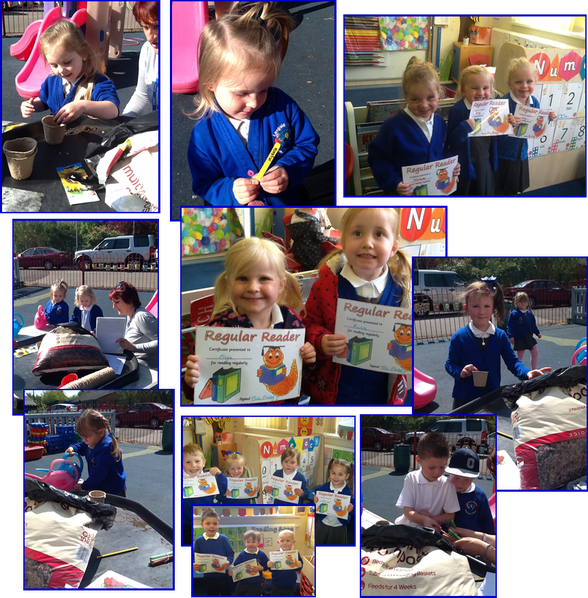 This week, we have been celebrating our regular readers’ achievements, as we do every Friday. These are children in nursery who share a book at home with their parents at least four times a week and do this over a four week period. If they achieve their target in a week then they receive a stamp in their reading diary and when they have accumulated four stamps they get to choose a prize from Miss Frisby’s prize box and they are awarded a certificate. The children wait with baited breath as Mrs P gives them clues as to who has been successful this week and put their hands up saying, ‘Me! Me!’ even if it isn’t them! Children in nursery are not able to read yet- this magic happens in F2! But in F1 we are building the foundations with parents at home by drawing attention and associating words with both pictures and real world objects, and then our children learn the importance of language. Children love the sound of language before they even notice that there are words on a page. Reading books aloud to children stimulates their imagination and expands their understanding of the world. It helps them develop language and listening skills and prepares them to understand the written word. When the rhythm and melody of language become a part of a child's life, learning to read will be as natural as learning to walk and talk. So pick up a book and read with your child today and with your help your child will become an adult that reads easily and has a lifelong relationship with books! What a great gift to pass on to your child! We have also been planting sunflower seeds that will be going home as soon as they have grown a little bit. The children were fabulous at following the picture clues in the instructions and each planted their own seed and found their name on the lollipop stick so they could put it in the pot to know that it was theirs. We introduced the instructions on Monday and the children did a fabulous job of using the new language we had introduced. I can’t wait to see whose grows the tallest!